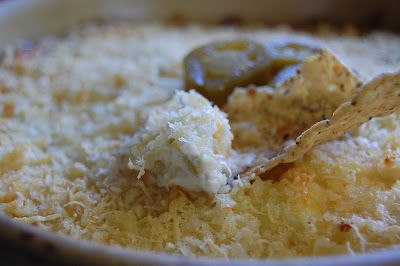 Another delicious recipe from Kevin over at Closet Cooking: Jalpeno Popper Dip. I shouldn't be surprised. Every recipe I've tried from Closet Cooking has been amazing. There was the Shrimp Quesadilla and the No-Bake Cheesecake. And we can't forget the incredible Shrimp Saganaki. Yum! This is yet another winner. Quick and delicious. Perfect for guests or for a weeknight at home in front of the TV. You can play with the amount of jalapeno to control the amount of heat. The creamy goodness of the cream cheese and the spicy bite of the jalapenos paired with the crunch of the panko breadcrumbs are even better that an actual jalapeno pooper, if you can imagine! Try it! I was a sucker for the poppers Kevin made... and I'm a sucker for this dip. Poppers are one of my absolute favorite things. Appreciate your visit to our blog!